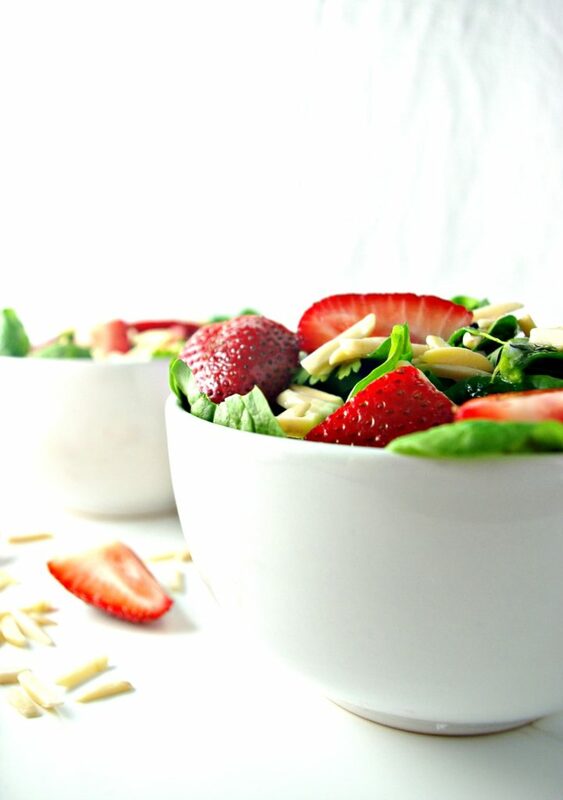 Strawberries, almonds, cilantro, and spinach take salad to a whole new level. 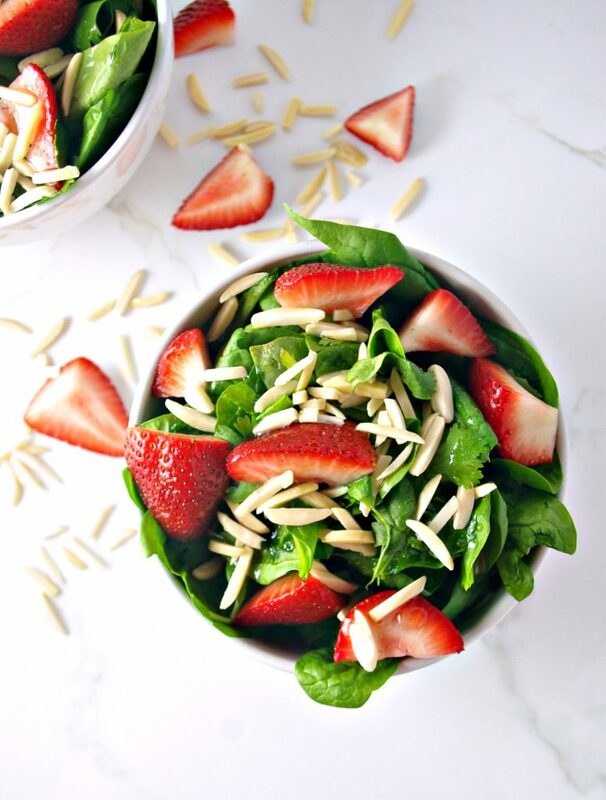 Easy prep and perfect as a gluten-free breakfast idea or a new take on a tired lunch, Strawberry Almond Salad is everything spring and anything but boring. Do salads make you sad? Are you bored with lettuce? The struggle is real. While chips and dip are always my spirit animals, salads have also always been a favorite. As a child, a neighbor girl (my first friend in the whole wide world) and I watched 9 to 5. Deciding we wanted to be like Lily Tomlin, Jane Fonda, and Dolly Parton, we played office for 8 straight hours the next day, complete with a lunch break, where we, like the women in the movie, ate a salad. From then on I was hooked on salad and playing office. As K-Hubs and I transitioned our family to a predominately whole foods diet over the last two years, I was grateful to have a love for salads. But as spring dawned this year, I became unknowingly bored with them. Exactly how many ways can I make this leafy green taste brand new? I was reaching for any ingredient other than one to make a salad, and I felt a little guilty about that. It’s not salad’s fault. It’s just doing the best it can to keep us healthy. A thankless job at best. This salad is emotionally revitalizing. It just evokes the feeling of spring, warm weather, bright days, birds chirping, and children laughing in the breeze. 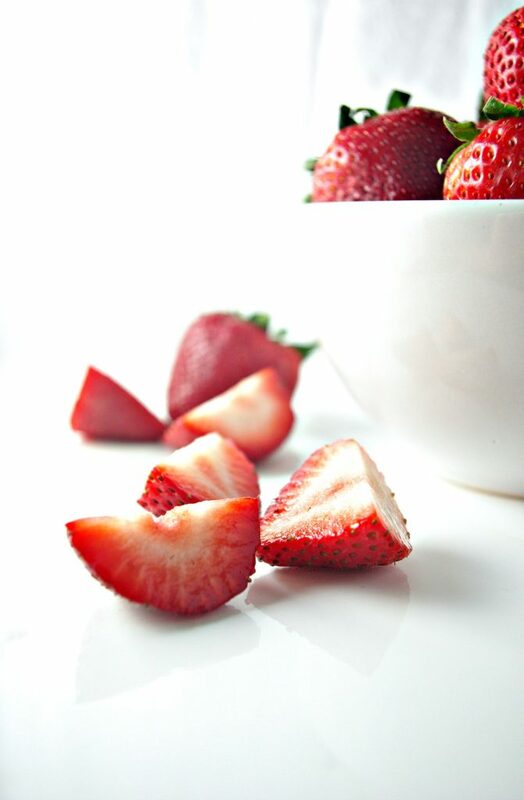 Fresh strawberries – the perfect amount of sweetness. Check. Sliced almonds for the perfect crunch. Check. Cilantro for balance. Check. And let us not forget the sweet dressing. I can’t not eat this stuff, and neither can K-Hubs. We have even eaten it as a breakfast salad. Not only is it breakfast-worthy, but it also has a few smoothie vibes going on, thanks to the flavorful dressing and almonds. Like, if a salad could be a smoothie, this would be it. It’s also so easy to throw together. First, layer the spinach with cilantro, then add almonds and top with strawberries. Finally, drizzle with dressing. Voila! You have a salad. Relationships shouldn’t be exhausting, and this Strawberry Almond Salad gets that. If you want to make a larger batch for a family gathering, then toss the greens in a bowl first, followed by a layer of strawberries, almonds, and dressing just before serving. If you want to take this to work for lunch, there are a couple ways to store it. 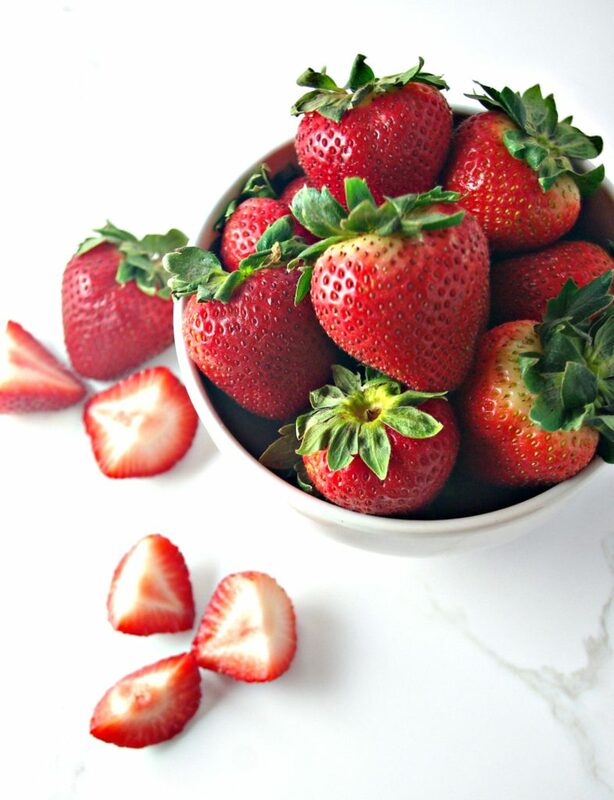 One, you can pour the dressing on the bottom of a glass jar, then pour in your strawberries, top with spinach, cilantro, and almonds, and then shake before eating. 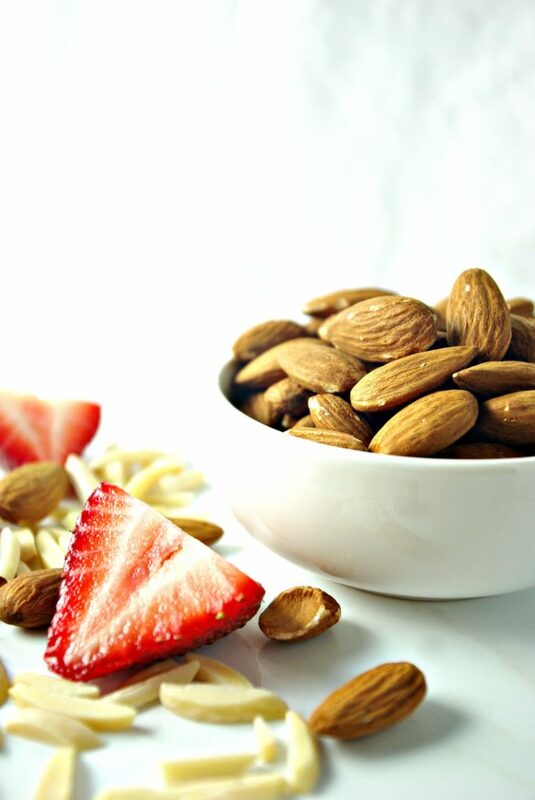 Two, you can put the greens and strawberries in one jar, dressing in another, and the almonds in yet another jar. This second option, although a bit cumbersome, will help keep the salad in its truest form. A note about this dressing (which also happens to be gluten-free, soy-free, and dairy-free! ): I err on the side of caution with how much to add to my salad. I don’t know about you, but soggy salads make me sad. So I start out with a little bit, toss, taste, and then add more dressing if I think it’s needed. I have even carefully drizzled more dressing in just the right places with a teaspoon. It gets a little ridiculous over here sometimes. 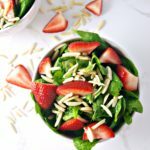 But, hey, girl’s gotta have the most perfect salad ever, and this sweet and savory Strawberry Almond Salad does the trick. Place spinach on two plates or in two bowls, and then layer with cilantro, followed by strawberry slices. Finally, top with almond slices and drizzle with salad dressing. Serve immediately or store in jars and consume within a day. To make the dressing, combine all ingredients in a bowl and then stir together. When you do, let me know how it turns out! Hope you enjoy it!